· Two Isolated TRS Expression Outputs – simultaneous control over multiple effect pedals or rack systems. · Sensor Output — 1/8-inch; four conductor output compatible with all Soundblox, Soundblox 2, or Soundblox Pro pedals. · Range Adjust Knob — Adjusts the range of expression signal sent through the outputs. · OUTPUT 1: sends expression signal out via either ¼ inch TRS cable or 4 conductor Soundblox compatible 1/8 inch sensor cable. · OUTPUT 2: sends expression signal out via ¼ inch TRS cable. · Rugged, cast aluminum housing. Dimensions: 7 in./17.8cm (length not including I/O jacks) x 4 in./10.2cm (width) x 2 in./5cm (height, including knobs). The Source Audio Programmable EQ is a thoroughly modern and highly streamlined upgrade to traditional equalizer pedals. This compact, rugged, cast aluminum stompbox provides quick, hands-free access to four different user programmed EQ settings. Whatever your instrument, playing style, or genre, the Source Audio Programmable EQ is the essential tone-sculpting tool for your live rig. Runs on a 9V battery (included) or power supply (not included). 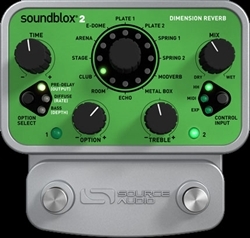 9V DC power supply included The Soundblox 2 Dimension Reverb offers 12 distinct shades of reverb. Choose from 6 reflectively diverse room sounds, two plate and two spring reverbs, modulation reverb, and echo. The assignable “Option” knob makes it possible to adjust 9 different parameters: wet/dry mix, time (i.e. resonance), bass, treble, pre-delay, diffusion, output level, modulation rate, and modulation depth. The Soundblox 2 Dimension Reverb features a compact, durable cast aluminum housing, 2 user presets, and Multi-function in and out jacks compatible with Hot Hand®, the Source Audio Dual Expression Pedal, or MIDI*. Use the Hot Hand Motion Sensor or the expression pedal for on-the-fly control over any of the 9 adjustable parameters, or plug in a MIDI controller for external access to presets and parameters. · Diverse Sound Palette — Features up to 24 different Low Pass, High Pass, Band Pass, Single Peak, Multi-Peak, and Notch filters. · Deep Control Set — Access to control parameters typically found in only professional rack-mount effects, or computer software. · Drive/Distortion Type — Add a variety of gain and distortions to any of the Manta’s effects for an added boost and flavor. · State-of-the-Art DSP — Our proprietary 56-bit Digital Signal Processor, the SA601, and crystal clear 24-bit converters. · Multi-Function Jacks — Use the Source Audio Hot Hand motion sensors, or Dual Expression Pedal, for on-the-fly control over modulation or any adjustable parameter. · MIDI Capable — Use the Soundblox HUB (connected to the Multi-Function Input) to allow MIDI access to controlling parameters, and save up to 128 user presets. · Universal Bypass — Select either analog buffered or relay based True Bypass. · Compact, rugged, cast aluminum housing. 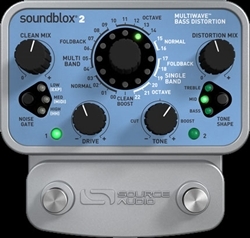 The Soundblox Multiwave Bass Distortion Pro inherits the power and clarity of the original Soundblox Multiwave Distortion and adapts it to the unique frequency range of the bass guitar. Bassists can effectively combine complex chords and intervals with distorted tones — multi band processing eliminates the mush and allows each note to ring clear and true. 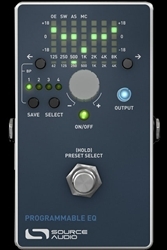 The pedal also features single band processing for more traditional distortion sounds. It’s the perfect pedal for both the studio and stage. Users have access to 23 modern and distinctive distortions and an additional clean boost/EQ mode. Distortion curve types range from “normal” overdrive for traditional sounds to “foldback” and “octave” for more aggressive synth-like tones. Each distortion type is further customizable via the 7-band equalizer, drive control, and separate mix knobs for clean and distorted signals. This advanced sound control alleviates the tendency for low-end reduction associated with most bass effects. Dimensions: 7 in./17.8cm (length not including I/O jacks) x 6 in./15.25cm (width) x 2 in./5cm (height, including knobs). The Soundblox Pro Bass Envelope Filter is an evolution of its hugely popular predecessor, the standard Soundblox BEF. As before, there are 22 different envelope filter effects to choose from including 2 Pole and 4 Pole Low Pass variations, Single Peak, Triple Peak, Peak/Notch variations, as well as Phaser settings. Each of these settings can be further modified with a variety of control options including positive/negative filter sweeps, sweep range, attack and decay speed settings, or frequency range selection. In this Pro version, users are able to choose from four different modulation sources including standard envelope filter sweeps, selectable LFO wave forms, a passive expression pedal and the Hot Hand motion sensing ring. An expression pedal input can be used to control filter modulation like in a standard wah pedal or a wide variety of parameters including sweep range, effect selection, LFO speed and more. As in our other Pro Series pedals, the BEF Pro features three footswitches to hold six customizable presets but also includes an option for Tap Tempo LFO on one of the footswitches.